It’s always nice to feel wanted and be welcomed back to a venue we have previously reviewed, so when the team at The Blue Peter in Alvaston invited us back we flew over pronto! The lady behind the bar greeted us warmly and took us around to the dining area, where our table was. There were already a couple of groups dining, and we sat down and looked through the menu. There is a fab pick-n-mix starter section now; individually priced at £1.99-£4.29, you can choose 3 for £8.49, 4 for £10.99, or 5 for £12.99 – British Tapas on a budget, if you will :) I opted just to have the Chicken Tikka pieces, and The Man Bird fancied the Breaded Brie Wedges with Cranberry dip. Having decided on our mains too, His Nibs made a note of our table number and placed our order at the bar. 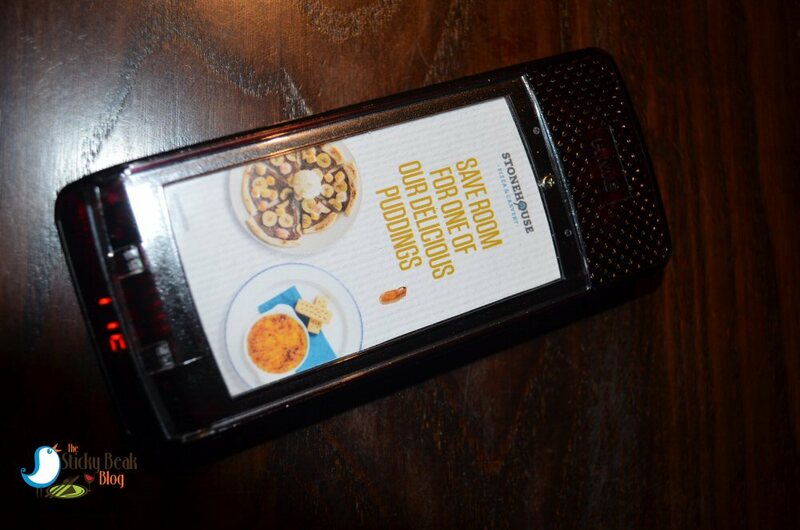 He came back with a rather nifty buzzer contraption that alerts you to the readiness of your main course. After a few minutes a lovely chap brought our starters out and they were nicely presented; although the plates etc aren’t flash, care and attention is put into placing (not just chucking) the food on the platters. I was very surprised by the amount of Tikka pieces there were, and they weren’t piddly bits either, they were nice sized chunks of Chicken breast. There was a lovely spiciness to them that will appeal to all but the mildest fans, and the minted Yoghurt was drizzled over nicely rather than drowning everything out. 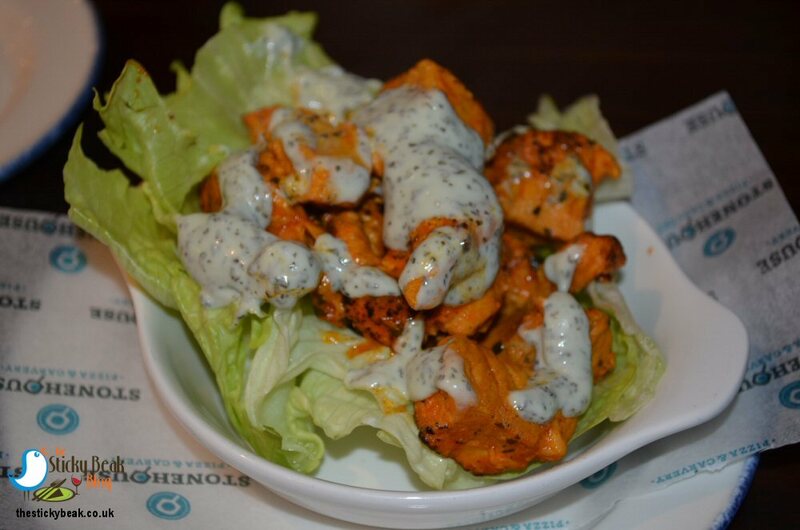 Crispy, crunchy Iceberg lettuce was a chilled contrast to the piping hot Tikka pieces. 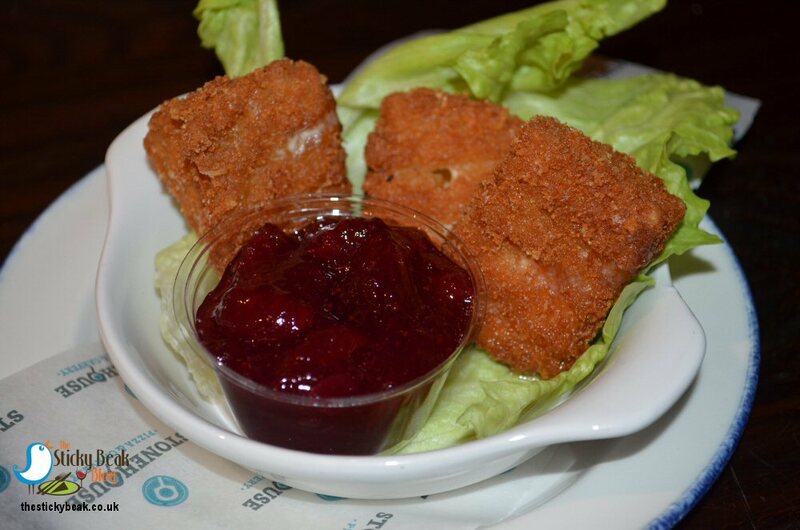 The Man Bird was just as happy with his choice of starter; a trio of good sized Brie wedges were sat on a bed of lettuce, with the jewel coloured dip in a separate pot. Chef had ensured that the wedge outers were wonderfully crunchy and when bitten into they revealed their molten centre. Our lovely server had come to check that things were to our liking, and was a very happy soul to be taking clean plates back to the kitchen. I’d gone for the Simply Chicken breast burger with “Billy the Kid” as an extra topping (Goats cheese and Red Onion chutney), and The Boy Wonder plumped for the Sweet Chilli Chicken pizza. Instead of the regular tomato sauce base, this has a sweet chilli sauce at its heart and is topped with chicken pieces, Mozzarella, Pepper, and Red Onions. 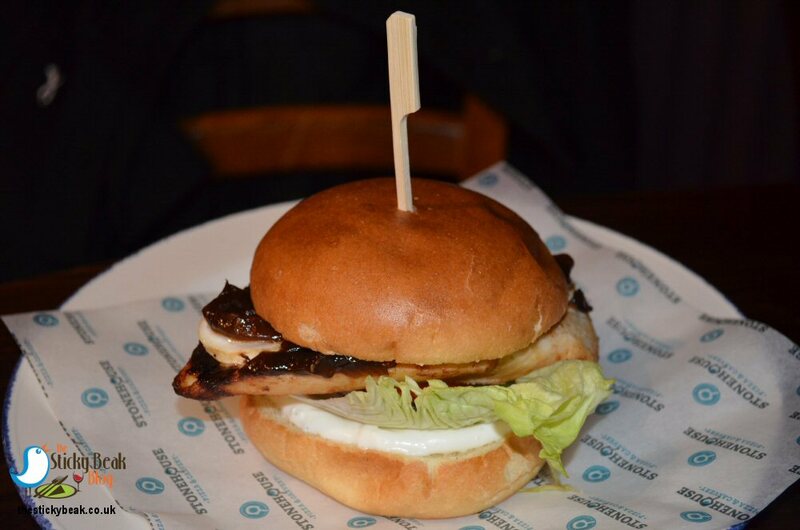 My burger was a lovely deep affair, with a plump chicken breast in the centre. There was classic Lettuce, beef Tomato, onion slices, and Mayo to accompany it, as well as a lovely thick slice of Goats cheese and sticky chutney :) The food was piping hot and the chicken was nice and moist still as I bit into it. What I really liked though was the fact that the toasted Brioche bun wasn’t huge, so I actually got the full burger experience rather than just a mouthful of bread; nothing bugs me more than eating a burger in a bun and just chewing on bread! His Nibs loved the thin, crispy pizza base; just like it should be - that’s how the Italians do it. It was lovely and hot having literally just come out of the pizza oven :) The sweet Chilli sauce made a lovely base, more so than you would expect, and it was a superb partner for the other ingredients. 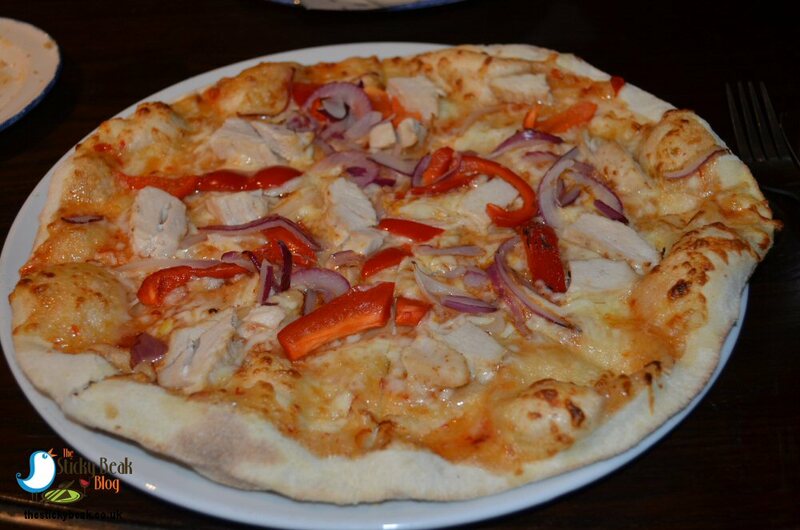 As with my Tikka pieces, the chicken on His Nibs’ pizza was lovely and big, so it was satisfying when bitten into. There was plenty of pepper slices and onions to crunch on too, and the melted Mozzarella was delicious. All in all, we were feeling pretty smug about our choices. The Man Bird had gone to the meat Carvery counter to get some chips, and I went to the designated salad bar. 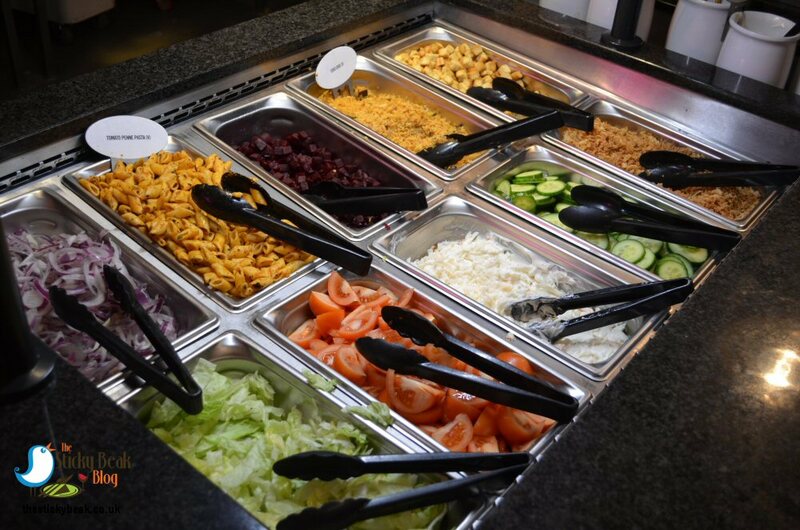 For a chain pub (which is essentially what The Blue Peter is) the salad bar was pleasingly well-stocked without having too much choice; sometimes you can have too much of a good thing. 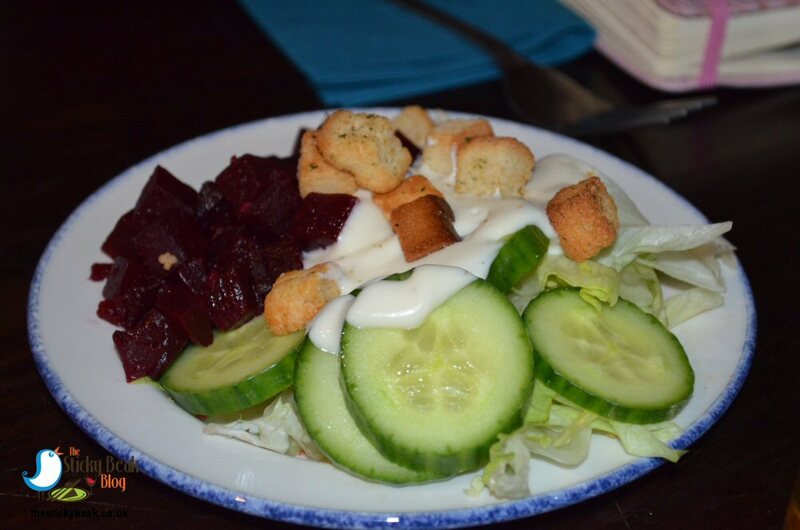 All the basics were covered - Cucumber, Tomato, Iceberg Lettuce, Beetroot, Red Onion slices - and then there was Cous Cous and Tomato Penne pasta, as well as crispy bacon bits, and croutons. Everything was kept topped up and fresh, including the salad dressings; I went for the Blue Cheese sauce, but there were Ranch and Thousand Island varieties too, as well as Mayonnaise. 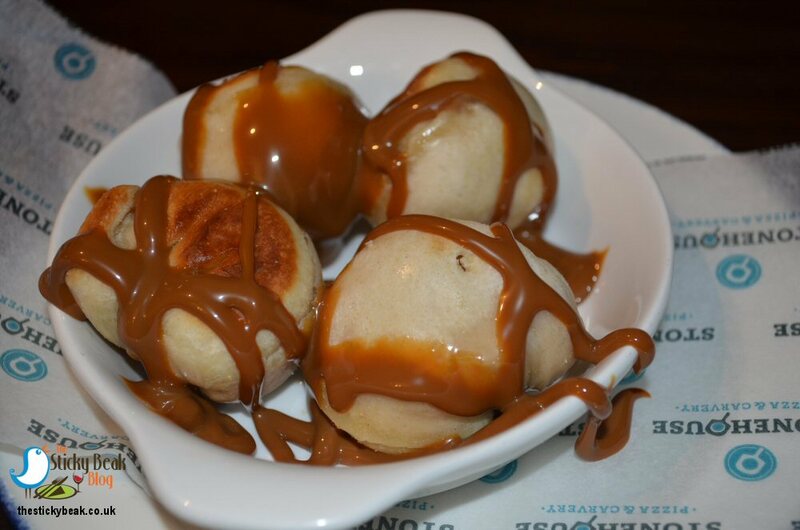 Whilst we were waiting for our coffee and desserts, I noticed that The Blue Peter does a meal deal all day Monday-Saturday; if you order dessert at the same time as your main course, you only pay an extra £1.75 - pretty much half price for most desserts on the menu. Boom! My Black Cherry Cheesecake was a bought-in one, but no less tasty for it. 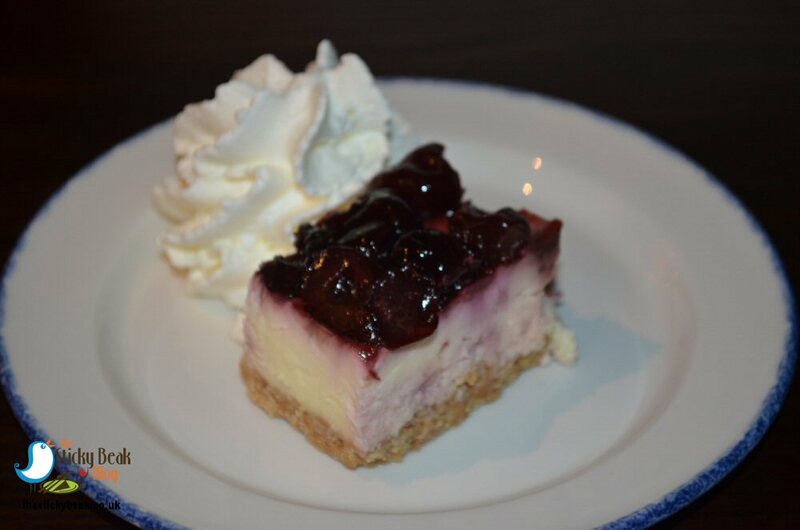 The cheesecake was lovely and creamy, and it had a nice thick topping of the Cherries and a buttery biscuit base (don’t start hearing Greg Wallace in your head, folks ;)). The Lavazza coffee was a nice blend too, the perfect finish to a pleasant meal. 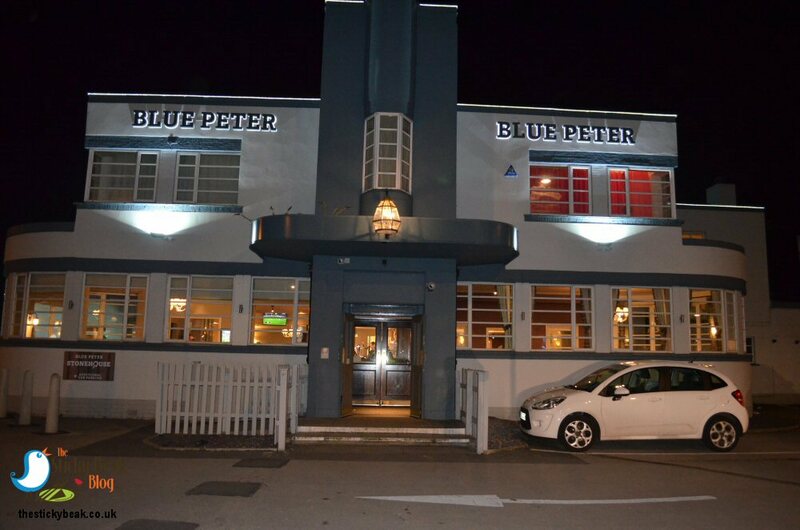 The Blue Peter isn’t posh, or serves haute cuisine - but it isn’t even pretending to be that type of venue. As far as chain pub food goes, this venue definitely does its job well. 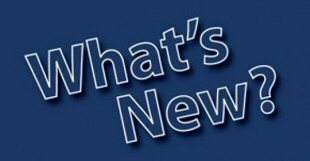 The premises are very clean, the staff are friendly and helpful, the food is hot and plentiful, and it represents excellent value for money. To my mind, it gives you everything you could want from this type of establishment. They do serve a nice range of Gins too; I indulged in a Hendricks and Tonic, but could’ve had Gordon’s, Tanqueray or Bombay Sapphire if I wanted.